ORLANDO — Leaders from the American Association of Community Colleges (AACC) believe that it is a “moral imperative” for the institutions to further their support of the millions of students who show up at their campuses. The four-day conference features more than 150 sessions for community colleges to assess, improve and sustain their institutional work around student learning, retention and persistence; cultivating inclusive environments; building strategic partnerships for student success; professional development for faculty; and notably, workforce development and training. During a session focused on community colleges’ role in preparing the “21st Century Worker,” Kurtinitis pointed out that the nearly 1,100 community across the country provide a “continuum of education” in the form of degrees, certificates, credentials and more. Convention attendees heard from community college presidents about how their institutions have created apprenticeships and internship opportunities for students through strategic partnerships with regional industries. Panelist Dr. Mary Graham, president of Mississippi Gulf Coast Community College, emphasized that a key part of establishing partnerships involves having “deep and crucial conversations” with the industry partners themselves to define the outcomes and expectations for students’ experiential learning and paid opportunities. Graham added that faculty should also be involved in this work and up-to-date on their teaching credentials and knowledge of relevant concepts so that they can better support learners’ career development. In addition, community colleges should be doing continuous quality improvement to assess program outcomes and figure out which programs are working, should be improved or eliminated altogether, said Dr. Rebecca Lake, dean of workforce and economic development at Harper College. Other sessions offered case studies of how community college administrators and faculty members have reformed their advising, first year experience course and other student support structures, or identified policies that may facilitate or prohibit student success. Dr. Aubria Nance, a college counselor and associate professor of counseling at the Community College of Philadelphia, led a discussion session that placed several institutions’ policies around academic probation, student withdrawal and attendance, admissions advising or late registration into “pro-enrollment” or “pro-retention” categories. Nance said that institutional leaders should be mindful of how they implement their policies to ensure that students receive the support they need without jeopardizing their academic success. In the case of academic probation, for example, Nance said equity should play a role in if schools place students on academic probation for a semester or full year. 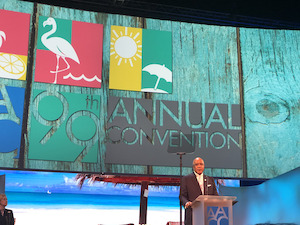 Sessions and presentations about peer-mentoring, guided pathways lessons, emerging technologies in higher education and high-demand industries such as cybersecurity were also included in AACC’s convention schedule. Jee Hang Lee, ACCT’s vice president for public policy and external relations, said the organization wants the reauthorization of the Higher Education Act to include an increase to the Pell Grant maximum in addition to the return of second-chance Pell grants for incarcerated students. ACCT has also been pushing to prevent unnecessary loan borrowing for students and reject risk-sharing agreements that would impact community colleges’ funding sources, Hange Lee said. “We want to see that Pell grant maximum increase by $200 this year,” said Jim Hermes, AACC’s associate vice president of government relations. AACC’s additional legislative priorities include support for passage of the DREAM Act; an increased inflation-level investment in Federal Work Study, TRIO, Gear Up and other higher education programs; and more support for Title IIIA and Title V programs. With discussions about policy, curriculum, program development and student and faculty development, “there is something for everyone,” he said. Noting that he has taught in both urban and rural college settings, Mason said much of the information from the plethora of sessions can be applied everywhere. “We all learn better from other people’s mistakes, or what they’ve done really well,” Mason said. Bumphus noted that community colleges are increasingly being recognized — nationally and internationally — for their innovative work to support students.